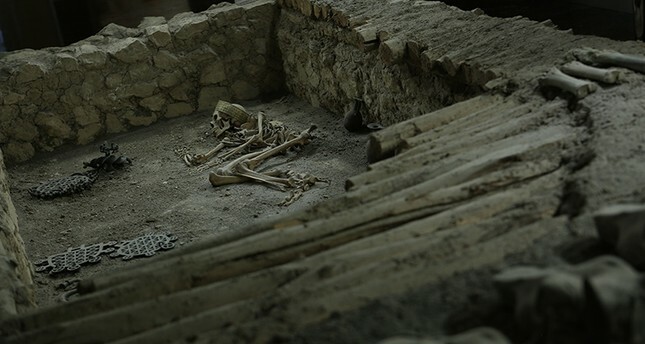 Archaeologists uncovered a 4,500-year-old male skeleton adorned with jewelry in the northern Turkish province of Çorum. The settlement under excavation, in the Uğurludağ village of Resuloğlu, is believed to have begun during the Early Bronze Age and continued through Seljuk and Ottoman periods. From the baked clay and metal gifts found in the grave site, archaeologists found out that the settlement's 300 residents were skilled in agriculture and mining. The style of weaponry suggests the community was of Caucasian and Mesopotamian origin. Burial sites yield important insights into the culture of a people, from religious beliefs to fashion sense, explained Director of Excavation, Ankara University Professor Tayfun Yıldırım to Anadolu Agency. Based on necklaces, anklets and bracelets found on both male and female skeletons, Yıldırım suggested that the people of the settlement followed fashion trends, much like modern societies. The town of Resuloğlu is 50 kilometers from Alacahöyük, another Neolithic and Hittite site where the earliest examples of copper and stone tools were discovered. Systematic excavation of the royal tombs at Alacahöyük and Resuloğlu began in 2003.